I really like Maryland, I do. At first I hated it. For starters, it’s very cold in the winter. Never the less, over the past four and a half years, it’s really grown on me. But the first thing I do everytime I go home is go to Bojangles (which has the best slogan ever- “Born and Breaded in the Carolinas”). Now, I’m aware that there are a handful of Bojangles north of Richmond. But I don’t trust them. In high school I went to one, and they didn’t serve sweet tea. And that’s just not natural. What draws me back to Bo’s again and again, is their chicken biscuit. It’s a spicy chicken filet on a buttery, flaky, divine biscuit. Now, at home I prefer my biscuits with a fried egg, cheese, and a little bacon. But the actual biscuit itself, well that needs to uphold the standard of delicious biscuits… flaky, buttery, melt in your mouth goodness. And this recipe certainly does that. 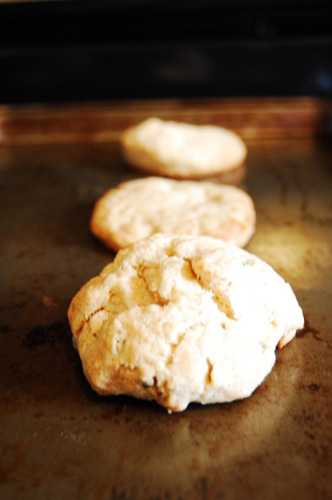 It produces perfect biscuits time and again, and you don’t have to worry about sticking to the recipe exactly, it fudges pretty easily. So let’s talk about this recipe. The measurements I’m going to give you make about ten biscuits. Now, since I can never seem to find the ability to eat ten biscuits before they go stale, I make a mix, and measure out of that as needed. In my opinion, the key ingredients here are the pastry flour and the heavy cream. I also add in fresh rosemary, which is totally optional. I think rosemary is one of the most heavenly herbs. 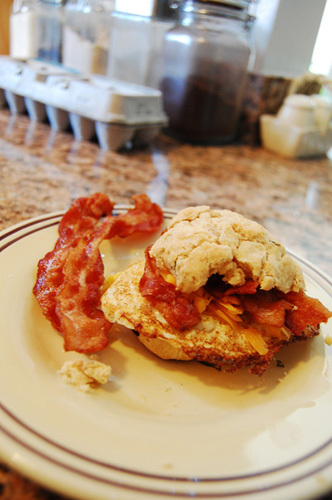 It brings a really succulent flavor to the biscuit, which works harmoniously with the flavors in the eggs and bacon, but probably wouldn’t be so complimentary to other things. So feel free to substitute the rosemary with other herbs or spices, or to leave it out completely. One last note about the tools… Since I recently made hand pies, I purchased biscuit cutters. Prior to that, I was using a glass cup, which frankly worked almost as well. Really, even patting the dough into a round shape will produce a biscuit, which is always what I do with the dough scraps. The only downside to that is that the biscuit tends not to be committed to being one biscuit, so it’s no good for cutting in half and loading with other foods. Like I said, this recipe is nothing to be afraid of. Frankly, it lets you fudge it here and there, and unlike other biscuit recipes, it actually takes effort to mess it up. Preheat the oven to 475(f). 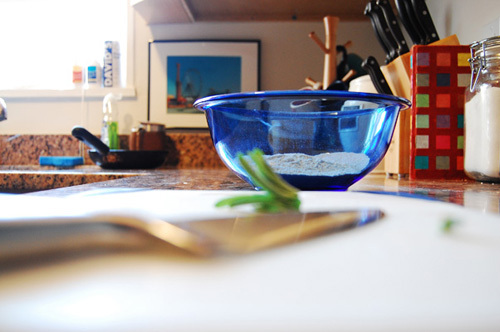 Whisk together the dry ingredients and the rosemary. Use fingers to incorporate cold butter. With the butter, you really just have to knead it with your fingers until the mixture has a course texture, like corn meal. Pour in cream. 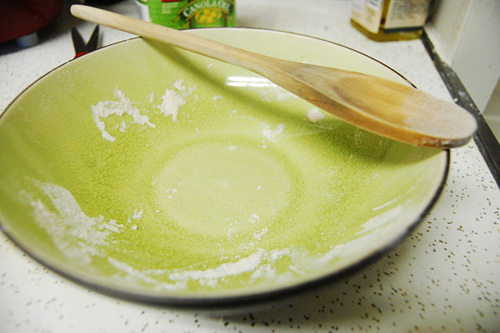 Stir (preferably with a wooden spoon) until dough forms. It’s okay if the dough is a little sticky, you’ll work it out on the countertop. 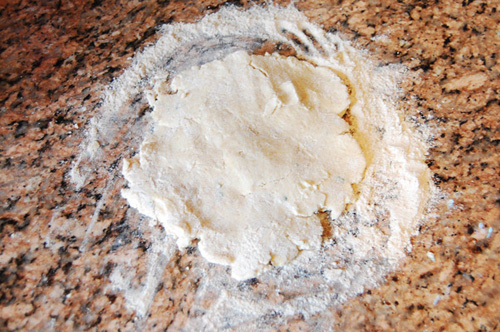 Sprinkle the all purpose flour onto the countertop and scoop your dough onto it. Use your hands to flatten it out. I like to flatten it a little, flip it, and flatten it some more. This method ensures that one side doesn’t get over worked, which is important. If your dough (and this goes for any dough, really) ever gets too sticky and unmanageable, pop it into the fridge for twenty minutes or so. The stickiness is really coming from the butter getting too warm, so cooling it off will allow it to firm up a bit. 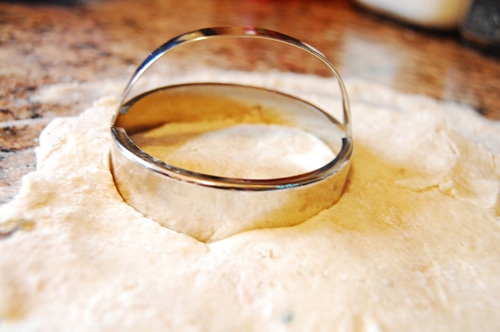 Using a biscuit cutter (or whatever you have laying around), cut the dough into circular shapes. Place on ungreased baking pan. Now, I put aside the measuring cup that I used to hold the heavy cream and melt the butter for glazing in that. It just gives it an extra creaminess. Using a baking brush (I use a silicon one, but anything will do), brush melted butter on top of the biscuits. Bake for 10-12 minutes. One word of advice if you are going to slice these biscuits in half and stuff them with things. Give them five minutes to cool off before you cut into them. Otherwise they’ll crumble and you’ll have a hard time eating anything sandwich style on them. Early in high school, I decided to become a vegetarian. My decision was heavily influenced by my new friends at Durham’s art magnet school. Abandoning pork may have won me some points at school, but breaking the news to my family was a whole different ballgame. I’m pretty sure my father was annoyed at me everytime we ate together the four years that I was a vegetarian. Not to mention the pathetic sad eyes he gave me everytime I turned down a bowl of brunswick stew or a pulled pork barbeque sandwich. I’ll never forget my grandmother’s reaction. 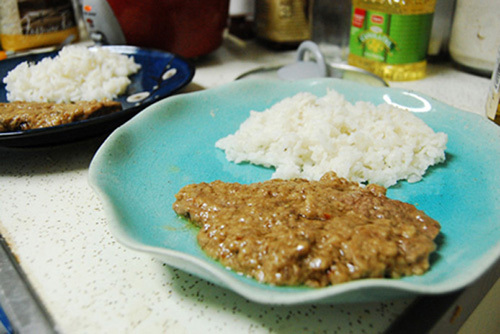 We went over to her house for dinner, and she had made country style steak, a tender beef dish that is served traditionally with rice and gravy. When I turned down the steak, she just looked at me, smiled, and in her sweet southern drawl said “we’ll that’s alright, you can just eat some rice and gravy.” I didn’t have the heart to turn down the beef gravy, so my first vegetarian meal with my grandmother was, well, not vegetarian at all. Country style steak is an important dish to North Carolina cuisine. Not to be mistaken with chicken fried steak, country style steak is lightly breaded, fried in oil, and then cooked until tender in gravy made from its drippings. 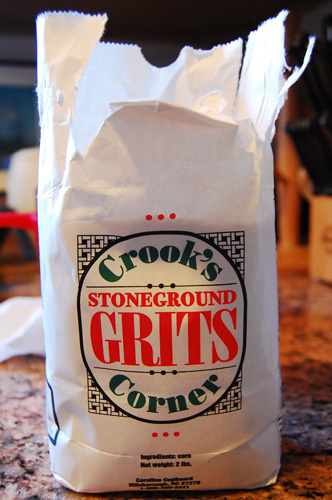 Traditionally, it is made from less expensive cuts of meat, that have been tenderized. This is why the slow cooking method is ideal, it makes tougher meat as succulent and easy to tear apart as a more expensive cut. I adapted this recipe from my memory, and it turned out pretty well. It needs some tweaking- I don’t think that I got the gravy just right, but it satisfied my craving for country style steak. I used cube steak to avoid having to tenderize the meat. The only difference between using a cube steak versus something else is that if you are tenderizing, you need to coat with flour, tenderize, and then coat again. The jasmine rice was also a nice touch, it gave a good contrast to the salty steak. Next time I may toss it in a little butter first. 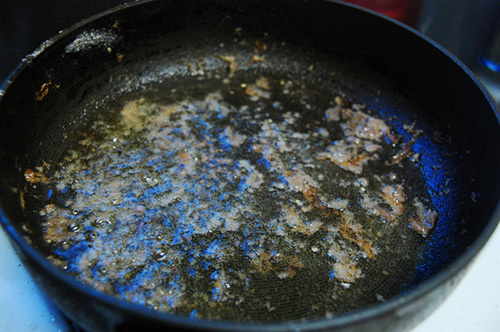 Heat 1/4 cup vegetable oil in pan. Dredge steak in flour, and brown. 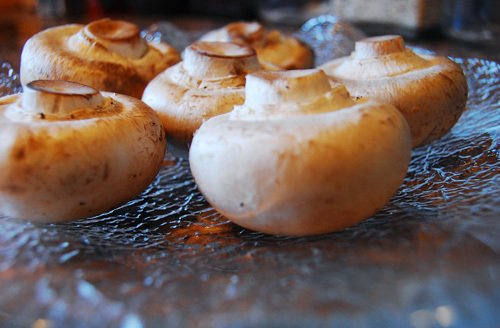 Once browned on both sides, remove from heat. 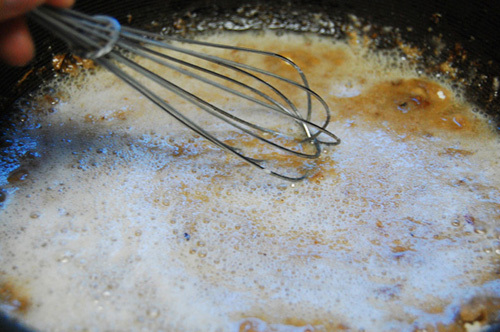 Whisk in flour, quickly. Add extra oil, if necessary. 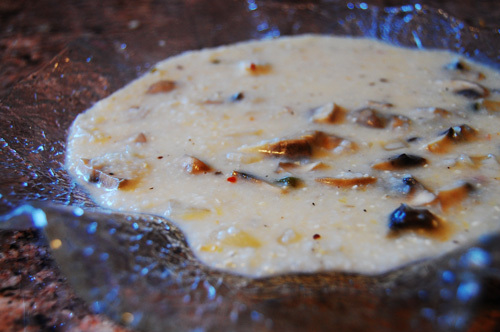 When flour is incorporated fully, begin to add chicken stock. Add gradually, until your gravy thickens. 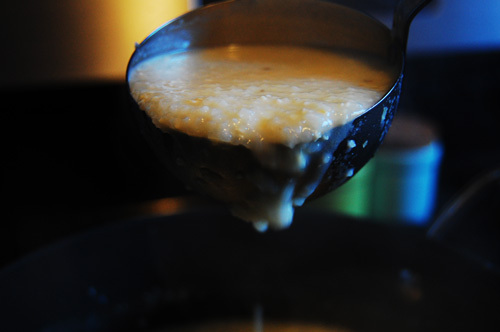 Gravy should be a smooth consistency, not too liquid. 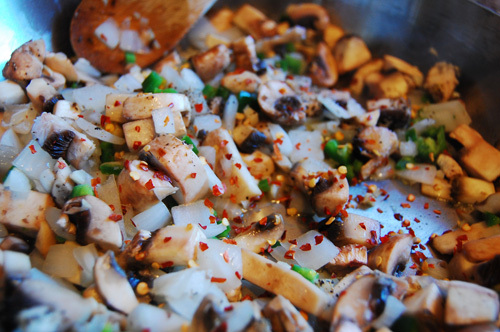 Add salt, pepper, and red pepper flakes. Stir in butter. Return steak to gravy, and cover. Let simmer on medium heat until meat is tender. Serve with jasmine rice. Rice can be substituted with mashed potatoes.